LADY CHARLOTTE JOHNSON was born in Little Rock, Arkansas and is the oldest of five children. She received Christ at the age of 11 years old at Holy Temple Church of God in Christ in Little Rock, Arkansas. Lady Johnson was an active member of Holy Temple where she was a member of the junior and young adult choirs, attended youth bible study and assisted the Sunday School teachers. Upon graduating from high school, she attended University of Arkansas – Little Rock where she majored in Elementary and Early Childhood Education. She married her childhood sweetheart, Elder John M. Johnson in 1976 and moved to upstate New York while Elder Johnson served in the Armed Forces. Upon honorable discharge from the service, the family relocated to Kansas City in 1980. 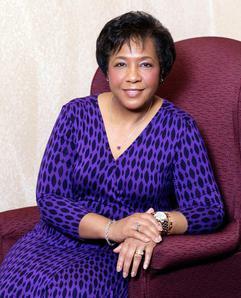 Lady Johnson became the First Lady of the Missouri Western Second Jurisdiction when her husband of 40 years, Superintendent John M. Johnson, was installed as Bishop on November 9, 2009 during the last Holy Convocation that was held in Memphis, Tennessee. She became the Region 11 First Lady in May of 2014, at the National Spring Workers Conference, when Bishop Johnson was appointed Region 11 Chairman of Bishops covering Missouri, Kansas, Nebraska and Iowa by Bishop John H. Sheard, Chairman of The International Board of Bishops. In her adult walk with Christ, she has served in various roles such as church secretary, treasurer, choir member, Sunday School teacher, Sunshine Band leader and Women’s Conference coordinator. She is the President of the Barker Memorial Cathedral of Praise Women's Department; First Lady of Missouri Western Second Ecclesiastical Jurisdiction, and President of the Jurisdictional Pastor's and Minister's Wives. She is a supportive wife and the mother of two daughters, Tracie Johnson and Tamara Hill, one son-in-law, Lamar Hill and two grand daughters, Arielle and Isabelle. Lady Johnson is on fire for the Lord and an inspiration to all females, young and old, throughout the Jurisdiction, as well as the National Church of God in Christ.